Daniel Strelitz has won the 2017 World Poker Tour L.A. Poker Clasic $10,000 buy-in no-limit hold’em main event. The 27-year-old poker pro based out of Orange, CA overcame a field of 521 players to win his first WPT title and the top prize of $1,001,110. This was Strelitz’s first-ever seven-figure score. His largest prior live tournament cash came when he finished second in a $5,000 no-limit hold’em event at last year’s World Series of Poker for $338,774. He now has career lifetime live earnings of $2,619,471. In addition to the title and the money, Strelitz was also awarded 2,100 Card Player Player of the Year points. This massive win was enough to catapult him into third place on the Player of the Year leaderboard, which is brought to you in 2017 by the very same casino that hosted this tournament, the Commerce Hotel & Casino. Strelitz came into the final day as the commanding chip leader, with his 6,485,000 stack being more than twice the size of any other stack belonging to the rest of the final six players. Although he had a sizable lead, he also had tough competition to deal with including three WSOP bracelet winners in Jesse Martin, Mike Sexton and Simeon Naydenov. 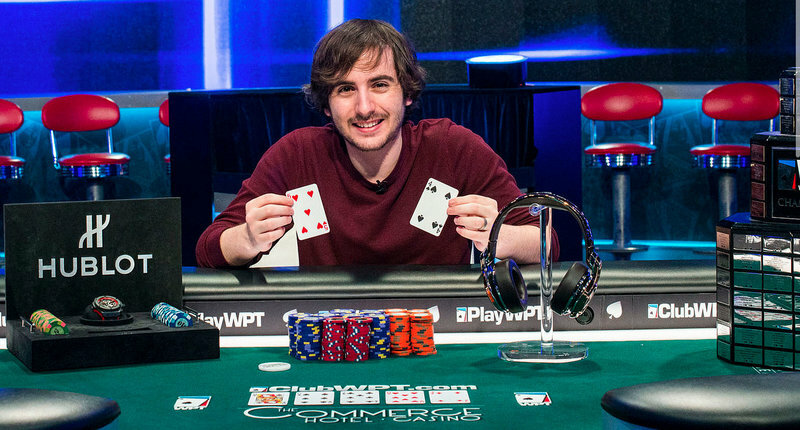 Sexton was the only player at the final table going for a second title on the World Poker Tour, with the Hall of Famer and longtime commentator for the WPT having taken down his first in the WPT Montreal event last fall. Strelitz eliminated Sexton, calling his short-stacked button shove from the big blind with the A 7 . Sexton was ahead with the K K but Strelitz overtook the lead right away with a flop of A J 7 . The turn brought the 9 and the river the A to lock up the pot for Strelitz, increasing his chip lead and sending Sexton to the rail in fourth place. Sexton earned $300,690 for his impressive run. Three-handed play lasted for more than 60 hands. In the end Simeon Naydenov won a race with pocket eights versus poker pro Jared Griener A Q to send him to the rail in third place ($431,340) and set up the final heads-up showdown. Naydenov began with a slight chip advantage over Strelitz, but both players started two-handed play with more than 70 big blinds. The two battled for 40 hands, with Strelitz jumping out to quick lead. Naydenov was able to mount a few comebacks, but eventually Strelitz began to pull away. By the time the final hand arose Strelitz had roughly a 2-to-1 lead with blidns at 60,000 – 120,000 with an ante of 20,000. Strelitz raised to 260,000 from the button and Naydenov called The flop brought the Q 7 6 and Naydenov checked. Strelitz bet 325,000, and Naydenov opeted to go for the check-raise to 975,000. Strelitz made the call and the turn brought the 8 . Naydenov checked and Strelitz bet 1,350,000. Naydenov went into the tan a but before electing to move all-in for 3,860,000. Strelitz made a quick call with the 5 4 for a turned straight. Naydenov was drawing dead with the K Q for top pair. The 4 on the river was a mere formality as the pot and title were already locked up for Strelitz. Naydenov earned $672,190 for his runner-up finish. Winners photo courtesy of Joe Giron / World Poker Tour.